Sagittarius is the ninth sign in our Zodiac journey. It is the sign of the archer, poised, focussed, balanced, aiming his arrow towards Spirit. Sagittarius has a great deal to do with our will, our intent in life. The tests of the previous sign of Scorpio were very much about testing us to see if our vision is clear and our intent is focussed on moving forward. If we passed the tests of Scorpio – the test of Spiritual choices v’s personality gains - then we will be able to ascertain the truth clearly and thus focus on our evolutionary path – the growth of consciousness. This is very pertinent in our current times, as the world is currently wallowing in emotion, churning in endless circles and creating much unnecessary Karma! Our focus is very much in the personality– the ‘I’, ‘Me’, ‘My’, ‘Myself’, issues – and much less about the greater good of the whole, of which we are a part. We seem to have forgotten that without the whole, the parts can’t exist! We are at a critical point in human evolution. We are in times of great change – from one Zodiac Age to another – from Pisces to Aquarius – and from one level of vibration to another. A whole new ball game! It is a little like the change over from analogue phones to digital ones – the old system is no longer in operation, it won’t work any more! Similarly, our old ways of thinking, being and doing are no longer working. The old systems of separation, divide and conquer no longer serve us. The new energy is a faster, lighter energy of sharing and inclusion and is typified by the connectedness of the internet. What we now need is the focus and clarity of Sagittarius to help us navigate through the unquantifiable amounts of info available to us now. We need to be able to stand firm amidst the storm like the Archer, to clearly discern truth from falsehood and the useful from distractions – to use our mind like the excellent tool it is intended to be. * In ancient Atlantean times, (approx eighteen million to twelve thousand years ago), long before recorded history, the symbol for Sagittarius was a Centaur. Half man, half horse, the man is controlled by his dominant animal instincts. The driving force is his ambition to become a man and have the power to satisfy his animal urges. * In our present Aryan times ( 12,000 BC until now) the symbol is a white horse with a rider. The human is detached from the animal and thus has the possibility of controlling the horse and directing its animal instincts. He is man aspiring towards Soul consciousness. * In the Aquarian Age, the symbol will again change to show the man standing free, perfectly balanced, shooting his arrow towards the sun, the source of our spiritual energy. In symbolic terms, the horse represents our animal nature – instincts, habits, patterns our basic nature. The man is us – humanity – learning to balance our basic animal survival energy with our increasing awareness that there is more to life the just physical existence. 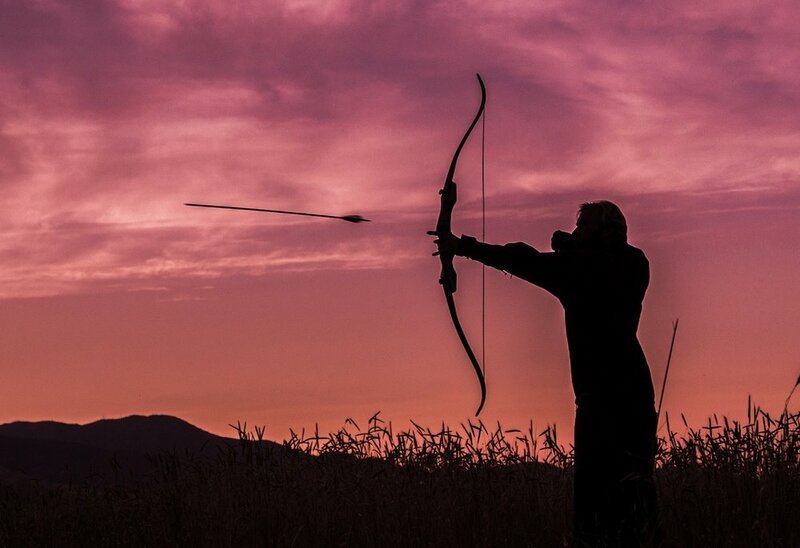 The bow is our will – the archer is bending the bow to serve his chosen purpose, to fuel his search for spirit. The arrow represents Truth, that piercing insight which brings vision and purpose far beyond the personality self and leads to idealism and evolution – the greater good of the whole. The goal? The goal is quite individual –‘ to each his own’, but ultimately it is to return to Spirit from whence we came, only now wiser and more knowing from having had our earthly experience. GOALS, VISIONS, PURPOSE and DIRECTION. Something to reach out for, to strive towards. Something beyond the personality self, the bigger picture. Sagittarius challenges and energises us to find our purpose. As a race, we need to move on! We have been stuck too long in materialism – it is time to look beyond, towards Spirit! It is only when our material world falls apart that we are challenged to seek beyond. Health, Religion, Politics, Finance, Climate change and everything else is under pressure because it is time we looked for the more lasting reality. The message of Sagittarius is to focus on the energies of truth and evolution, to use our will to clearly discern our directions and reap the rewards of being steady, focussed and on track. The energies of Sagittarius are a call to ‘get off our emotional horse’ and stand clear and steady so that we can see our directions in the light of the Soul’s purpose. Sagittarius is a wakeup call for humanity – do you know where you are going? Do you have a goal? Do you know your purpose for being? A goal is like a magnet, positioned in the future, pulling us inexorably towards it. It increases our willpower and determination to succeed in life. That sense of direction is the ability to focus all that we have and are towards achieving the goal. Sagittarius points the way to the future of humanity as a consciously Spiritual being, able to build a better world for all.